February 21, 1965: Malcolm X is assassinated in Harlem’s Audubon Ballroom. June 23, 1997: After surviving for a remarkable twenty-two days, his widow, Betty Shabazz, dies of burns suffered in a fire. In the years between, their six daughters reach adulthood, forged by the memory of their parents’ love, the meaning of their cause, and the power of their faith. 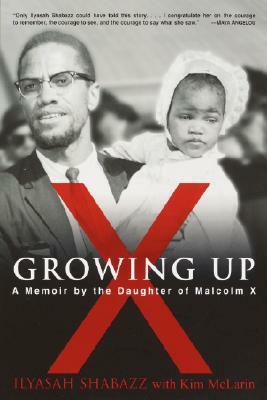 Now, at long last, one of them has recorded that tumultuous journey in an unforgettable memoir: Growing Up X.
Ilyasah Shabazz holds a Master of Science degree in Education and Human Resource Development from Fordham University. She is the Director of Public Affairs and Special Events for the City of Mount Vernon, New York. Kim McLarin is the author of the novels Taming It Down and Meeting of the Waters. She formerly worked as a journalist for The New York Times, The Philadelphia Inquirer, and the Associated Press. She lives with her family outside of Boston, Mass.